I go through phases of fascination with cities around the world. It's as if my soul is pulling me to a specific destination for whatever reason. In recent years I felt this way both prior to studying abroad in London and road-tripping to Nashville. For the past 6 months or so, I felt that familiar pull -- this time towards Seattle. One thing led to another and suddenly my mom and I had booked a trip to the west coast. We had a total of two and half days there so in preparation I Googled like a mad person, and asked a few friends for recommendations. If you find yourself with the opportunity to visit Seattle for a short period of time, here are some must-dos. Home to the legendary fish throwing. 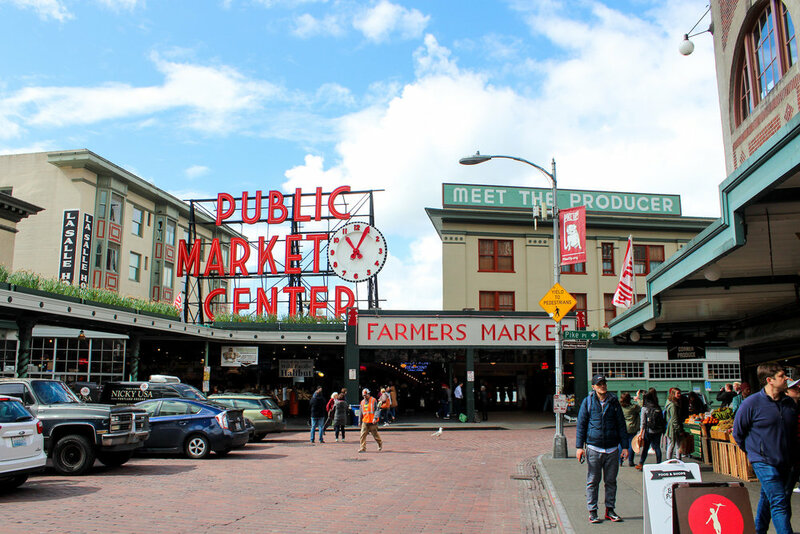 However, there's so much more to Pike Place Market than just impressive catches. There are a ton of different food vendors in the farmers market, and creative geniuses in the crafts market. My mom and I sampled fruit, cheese, roasted nuts, and her favorite -- pepper jelly -- while walking through. I bought a beautiful handmade travel journal from the crafts market that I cannot wait to start writing in. Although I fully embrace tourist attractions, I love the fact that you'll find tourists and locals alike at Pike Place. Specifically the one across from Pike Place. My mom's friend from college took us to this gem and I was in coffee shop heaven. Storyville has an amazing view of Pike Place, and the coffee is some of the best I've ever had (big praise). If you're in the area, have an almond milk latte for me. Aside from Pike Place, Chihuly Garden and Glass was at the very top of my mom and I's list. I didn't realize until a few weeks before the trip that I had already seen some of Chihuly's work both in London and Boston. I remember the first time I ever walked into the V&A museum, I was blown away (no pun intended) by the glass chandelier. I finally learned that the V&A chandelier is by Chihuly when I examined his work in a design class this semester. I couldn't miss seeing more of his work while in Seattle. Plus my mom loves anything glass related so it was a no brainer. His sculptures are unlike anything else -- you have to see them in person. When I tell you I ate until I thought I was going to burst at the seams, I'm not exaggerating in the slightest. I'm typically one of those people that stops eating when they're full no matter how good the food is because I hate feeling uncomfortably full. I made an exception at Cafe Flora. We went for dinner, but I hear their brunch is pretty unreal as well. We started with the fried olive and hummus platter, which we practically licked clean. As for mains, I had the oaxaca tacos and my mom had the heirloom potato pizza. The restaurant is filled with plants and is in a really fun/quirky neighborhood of Seattle. Basically, you need to eat here. The Starbucks Reserve Roastery is where the real magic happens. It's both an experience and an excuse for more coffee. It was explained to me as the Starbucks version of Willy Wonka's chocolate factory, and let me tell you -- that is SO accurate. You can chat with coffee specialists, try something off the special menu, and enjoy the roastery meets cafe atmosphere.